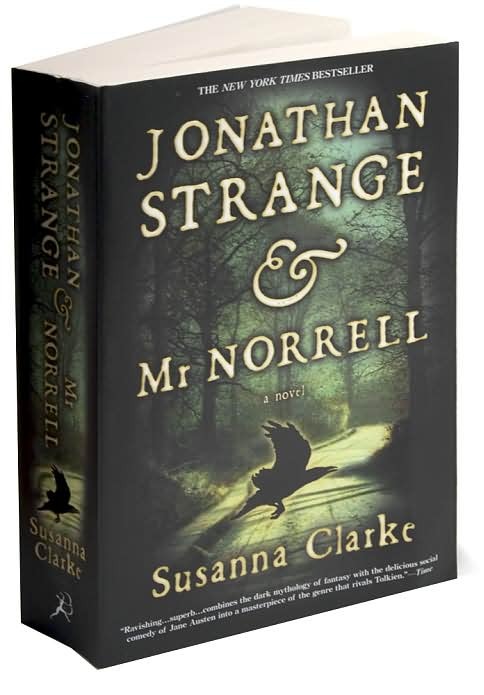 The first four pages of Jonathan Strange and Mr. Norrell, (at least in my edition, the 2005 paperback) is a list of praise and quotes from reviews as to the quality of this novel. Coming across this, and the size of the book, is extremely daunting to a reader, and the prospect of watching to see if a novel comes to the level of quality so proclaimed is a challenge in and of itself. Susanne Clarke has fashioned a masterpiece of English literature, one that throws back to a Victorian style, rich in prose and story, and is easily one of the greatest works of fantasy literature that I have ever read, rivaling some of the great classics of the genre, from J.R.R. Tolkien's Lord of the Rings to Philip Pullman's His Dark Materials. Jonathan Strange and Mr. Norrell is a complicated, extraordinary and exceptional work, and I am very pleased to have read. The story is one that is complicated and fascinating. It begins in 1806, and tells the tale of two magicians who come forward in England with the intent to return English magic to a nation that has long been without it. Mr. Norrell is the first to come forward, and begins to bring magic back into the world. He is shortly thereafter joined by a fellow magician under his tutorage, Jonathan Strange, and they begin to study and practice their new craft. Thus begins a tale of friendship, rivalries, prophecy and history. Some of the greatest themes of literature are present here, but the story plays out in a truly original manner. There is the story of the differences between the master and apprentice, and within that context we see a number of themes; old verses new, tradition verses innovation. This story takes place during the Napoleonic wars, which play an integral part of the direction of the characters. Interwoven throughout the story are well known figures: King George II, Lord Wellington, Emperor Napoleon Bonaparte, Lord Byron, and others, which give this story a rich historical context that borders on alternative history, but in a manner that far surpasses other known authors of the genre, such as Harry Turtledove, but in a way that far surpasses his works. Indeed, Clarke seems to pay as much attention to detail as J.R.R. Tolkien in his own works, with precise and detailed language to describe the events of the story. The story takes place throughout England and continental Europe, and feels like it. From the dialogue to the characters and to the descriptions, it is a quintessential product of England, and draws upon its long history and literature. Oftentimes, I would find myself reading and feeling much like I was back in the country, something that I have longed for much lately. I know of a number of the locations in the book, as well as a good deal of the history of this time, and Clarke's novel falls well within the context of the time and history here. This book is a very complicated one, and having finished it only a short while ago, I am still processing all that has happened. It is written far differently from most other books - much as in the style of Jane Austin, from what I've read and it takes some time to get used to. Indeed, I read this book in two parts - I had started reading it almost a year or two ago, and put it aside to read something more accessible. Returning to it just a little while ago, I found that once I got into the story and characters, the pages flew by. But beyond the normal story here is a book that is rich with story. Throughout the pages there are footnotes of references to the author's world, giving the readers insights into the surrounding history that helps to shape this story. A number of these footnotes could be an entire story within themselves, and Clarke has singlehandedly created her own mythology that not only stands well on its own, but is so detailed that one could almost mistake it for a mythological history in and of itself. This book is a stunning debut of a new author. Looking back over the first couple of pages of praise that has been bestowed upon this book, I can see why it has been rated so highly by reviewers and fellow authors of the genre, and I am thrilled to say that this novel lives up to all expectations. Clarke has brought forth a complicated, yet intriguing, read to the fantasy genre, one that is most likely destined to become a classic, and one that, despite its real world historical contexts, is highly original, innovative and entertaining, one that I am sure to return to, and highly recommend to all fans of the genre, or a good read in general.